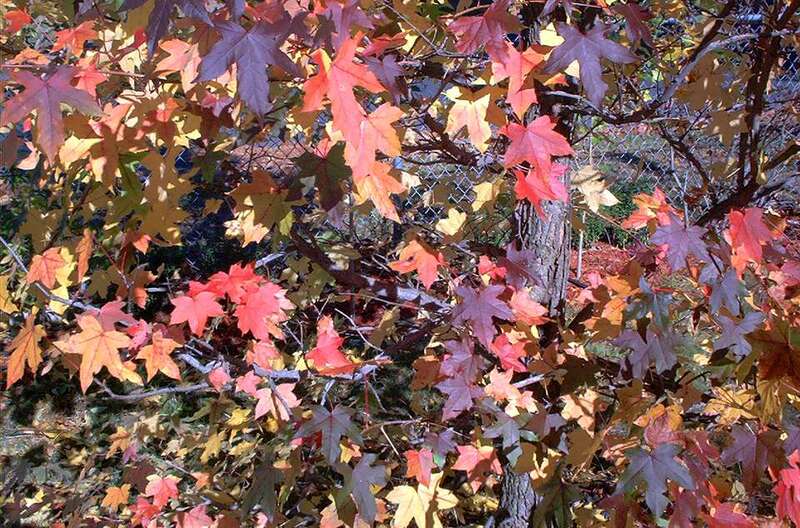 American sweetgum are deciduous trees prized for their star-shaped leaves that turn a mix of brilliant fall colors. If you're afraid of the messy "gumballs," or seed pods, produced by many sweetgums, look for a non-fruiting variety of this popular tree. Sweetgum are native to the southeastern United States and belong to the Altingiaceae family. The American sweetgum trees are classified as Liquidambar styraciflua according to plant taxonomy. Liquidambar styraciflua 'Rotundiloba,' is a sterile, non-fruiting culitivar of sweetgum that does not produce the famous spiky seed pods, commonly called "gumballs." Other cultivars do have the pods, which drop from the tree after the leaves fall in mid- to late-autumn and into winter. American sweetgum can reach 80 feet in height at maturity, with a spread of about 60 feet. The leaves, which are five-lobed and shaped like stars, provide excellent fall foliage color. In some cases, at the peak of the fall foliage season, certain leaves may be red, others purple, others yellow, and still others orange (all on the same plant). On some trees, the branches are "winged," as on winged euonymus (burning bush), displaying corky flanges. The bark on the trunk is deeply furrowed. Most people consider sweetgum seed pods (also called "fruits," "balls," "gumballs," "capsules") to be a negative, making it a landscaping mistake to grow these plants. The seed pods do make sweetgum among the messiest of trees to grow. Not only are they messy for you, but they are also potentially messy for your neighbors. If you live uphill from a neighbor, the gumballs may roll downhill onto the neighbor's property when they drop. That is why the fruitless Rotundiloba is the recommended cultivar to grow. Rotundiloba grows 60 to 70 feet tall. Its spread is about 30 feet at the base and narrows toward the top. Even a Rotundiloba may eventually produce a gumball here or there, but such a stray seed pod will be treated as a novelty rather than as a nuisance. American sweetgum trees are best grown in USDA plant hardiness zones 5 through 9. They are fairly drought-tolerant trees once mature. Grow them in full sun and in loamy soil that is on the acidic side. Fertilize them occasionally with compost. The sweetgum is practical as a shade tree, and for most gardeners it functions mainly as a specimen, especially for the autumn season. American sweetgum trees are moderate-to-fast-growing trees. But their best feature has to be their fall foliage color, which is not only rich, but also varied. You will appreciate the fact that you can get more than one autumn color on the same tree, which is also true of some maple trees. Another good feature of this plant is that its fall foliage develops rather late in the autumn (November in zone 5), meaning that it gives your landscaping color after the leaves of the sugar maples and red maples have dropped off their branches. Although most find the spiky pods (which look like they belong on a medieval weapon) messy, they do have their uses. Craft enthusiasts use them decoratively in creations such as Christmas kissing balls and wreaths, potpourri, and dried floral arrangements. Some gardeners report success using the pods as a "pest-control mulch" to deter critters such as wild rabbits, who do not like stepping on their spines. Other wildlife, including birds and rodents, will eat the seeds if you leave them out. But if you are not involved with crafts and don't want the extra landscape maintenance, you probably will not be a fan of these gumballs. If you can't find the pod-less 'Rotundiloba,' but you still wish to grow American sweetgum trees, plant them in an area where you will not have to bother cleaning up the pods. For those with sufficient room on their properties, one option may be to incorporate sweetgum trees into woodland gardens.